Blown Away #1 party today! Thread: Blown Away #1 party today! Hopefully it won't be too long until the single has it's #1 party, too! robinannhunt, vacarriefan256, dreamer11 and 8 others like this. Both pair of shoes are interesting. hjj, rainbow1 and nccountrygal like this. Congrats Carrie, and us fans too. I'm wondering if this wasn't a #1 party for Good Girl??? Perhaps the first tweeter misunderstood???? Or I'm confused because this Steph tweet says 15th #1 which Good Girl was. Possibly! 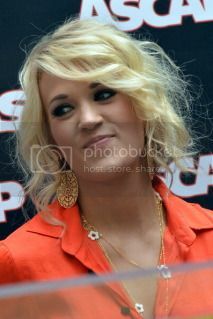 I know Carrie had a Good Girl #1 party with Country Aircheck back in June at the Opry (Country Aircheck Good Girl #1 Party - 05/06/2012 - ..:: Carrie Underwood Heaven Gallery ::..), but this could always be another party. Seeing as there seems to be a lot of press there though, I would assume that it was an album #1 party for Blown Away & they were just discussing how GG has given Carrie 15 #1s. Wow Carrie sure likes to wear shorts. lol It is her new uniform. Love the shoes-- funky! Thank you CarrieUK! Glenn will like her hair..I do too! She looks like a doll! Ann055 and glenn7 like this. wow ABC news was at a number 1 party? That seems odd. This must have been more then a number 1 party. rainbow1 and cyndi_sink like this. 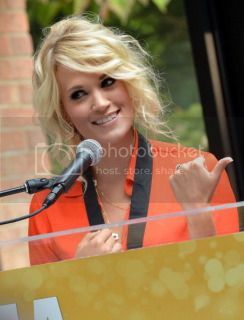 I don't think Carrie's ever had an album #1 party before (although she's had plenty of chances! ), but she did have a Carnival Ride launch party & a triple platinum party for Some Hearts, so there's always a first time for everything. @NashvilleBecca stated that she's "working on a story about [Carrie's] tour for tomorrow's news. She had some great things to say. ", so it could be a bit of an excuse to get Carrie speaking to the press about the tour seeing as the kick off is so close. I'm pretty sure this was the #1 party for Good Girl. I just got done watching an interview and it began with her talking about how it felt to have another #1 song. You are right! It was the Good Girl number 1 party! Here are Getty pictures and Chris Destefano was there, as well as Ashley Gorley. It is her new uniform! Well, here's my little write up for the event today with a mini-photo gallery from Getty. I'm sure I'll have another article to write once The Country Vibe publishes their interview tomorrow. Becca said she got some great info about the tour. Her answer to the second question was refreshing. She doesn't worry about any perceived lack of recognition for her songwriting. She enjoys the success and recognition she gets because it's a whole lot. gocountrymusic, Smokyiiis and rainbow1 like this. nccountrygal, glenn7, liveasong and 2 others like this. She does it every time! She's gorgeous from the first blonde hair on that head, and is perfect all the way down to her ankles. I love the shoes. Hate the shorts. Love the legs though. And the hair. Fanclub Exclusive Blown Away Listening Party 4/21 ! !